Into a Dutch oven, add the canola oil and the sesame oil. Begin heating the pot on medium high heat. When the oil starts to smoke slightly, add the sea salt, the scallions, the garlic, and the ginger. Cook the vegetables for 3 minutes stirring frequently. Add the Sriracha sauce, the rice and the soy sauce. Stir the rice well so that it gets coated with the soy sauce. Add the chicken stock. When the mixture begins to boil, cover the pot and transfer it to the preheated oven. Cook the rice in the oven for about 20-25 minutes until the rice has absorbed all of the chicken stock. Add the chopped zucchini and stir well. 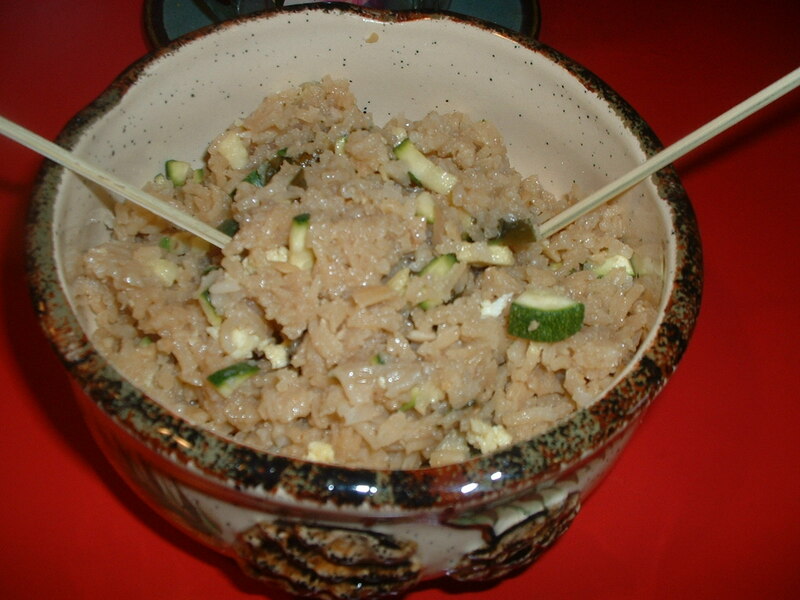 The heat of the rice will cook the zucchini. Garnish with the peanuts and the scrambled eggs. Serve at once. This easy to make dish makes for an excellent appetizer. Brush both sides of the Italian bread slices with the canola oil. Spread the slices of bread out on a cookie sheet. Top each piece of bread with a tomato slice. Sprinkle the top of each piece of tomato equally with the sea salt and the ground pepper. Top each tomato slice with a piece of the cheddar cheese. Bake in the preheated oven until the cheese melts and browns slightly. Let the bruschetta cool for 3-5 minutes before serving.